Spring, Texas – December 2nd, 2016 (Harris County Office of Emergency Management): A strong weather system entering the region starting Friday will deliver large amounts of rain across the area through Monday. 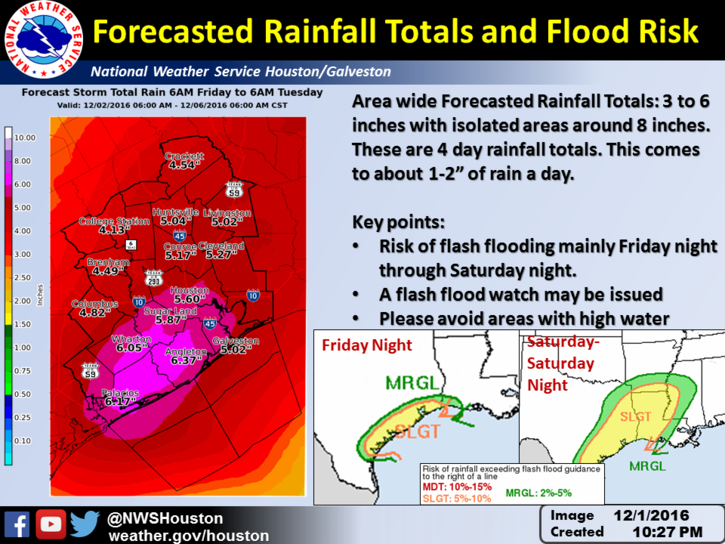 The National Weather Service forecast indicates rainfall totals through the weekend could average 2-4 inches across Harris County with 8 or more inches possible in isolated locations . The potential for street flooding will increase as rainfall totals may rise Sunday night-Monday morning. Floods are the leading cause of weather-related deaths. Residents should monitor local media and the National Weather Service (NWS) for weather updates throughout the weekend. Various watches and warnings may be issued by NWS as conditions change. Residents should follow all safety instructions in these messages. In the event of street flooding, remember “Turn Around, Don’t Drown.” Driving through high water or around barricades on flooded roadways or underpasses can lead to death! Know the NWS Flood Lingo! Flash Flood Warning: Take Action! A Flash Flood Warning is issued when a flash flood is imminent or occurring. If you are in a flood-prone area move immediately to high ground. A flash flood is a sudden violent flood that can take from minutes to hours to develop. It is even possible to experience a flash flood in areas not immediately receiving rain. Turn Around, Don’t Drown! ® DO NOT DRIVE through high water and DO NOT DRIVE AROUND BARRICADES! Just 2 feet of water can sweep your vehicle away. DO NOT WALK through flood waters. Just 6 inches of moving water can knock you down. If your home floods, STAY THERE. You are safer at home than trying to navigate flooded streets on foot. STAY AWAY from streams, rivers, and creeks during heavy rainfall. These areas can flood quickly and with little warning. MOVE important items – especially important documents like insurance policies – to the highest possible floor. This will help protect them from flood damage.